Modelling and Simulation in the Science of Micro- and Meso-Porous Materials addresses significant developments in the field of micro- and meso-porous science. The book includes sections on Structure Modeling and Prediction, Synthesis, Nucleation and Growth, Sorption and Separation processes, Reactivity and Catalysis, and Fundamental Developments in Methodology to give a complete overview of the techniques currently utilized in this rapidly advancing field. 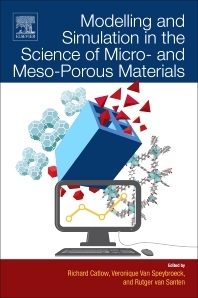 It thoroughly addresses the major challenges in the field of microporous materials, including the crystallization mechanism of porous materials and rational synthesis of porous materials with controllable porous structures and compositions. New applications in emerging areas are also covered, including biomass conversion, C1 chemistry, and CO2 capture. Veronique Van Speybroeck is full professor at the Ghent University and head of the Center for Molecular Modeling. She built up a large expertise in first principle kinetics in nanoporous materials in the frame of an ERC starting grant, awarded in 2009. Her current research focusses on first principle molecular dynamics simulations of complex chemical transformations in nanoporous materials, for which she received an ERC Consolidator grant in 2015. Rutger van Santen is full professor in Catalysis. He received his Ph.D. from Leiden University in 1971. In 1971/72 he was a postdoctoral fellow at SRI, Menlo, California in the Molecular Physics Department. From 1990 until 2001 he was scientific director of the Schuit Institute of Catalysis in Eindhoven and from 1992 until 2000 the first scientific director of the Netherlands Graduate School of Catalysis Research NIOK. He is recipient of the gold medal of the Royal Dutch Chemical Society (1981), the Ciapetta Lectureship of the North American Catalysis Association (1991) and the Bourke lectureship of the Royal Society of Chemistry (1996), Spinoza award (1997, NWO) and the Alwin-Mittasch Medal (Dechema, 2001). In 2004 he was awarded Academy Professor of the Royal Dutch Academy of Sciences and Arts. In 2001 until 2005 he was chairman of the Royal Dutch Chemical Society and Arts and Rector Magnificus of the TU/e. In 2005 he became director of the Schuit Institute of Catalysis and scientific director of the National Research School Combination Catalysis Controlled by Chemical Design (NRSC-C). Since 2008 he is member of the Board of the Institute for Complex Molecular Systems.